Nearly 1,100 University of Southern California employees at Keck Hospital and Norris Cancer Center voted overwhelmingly to approve a new three-year contract. The agreement not only makes USC one of the region’s highest-paying hospital systems, but it guarantees that more than 80 cafeteria workers whose jobs had been outsourced to Sodexo, a French conglomerate that pays pennies above the minimum wage, will become direct university employees. For Sodexo workers, joining the Trojan Family next year will mean big raises, employer-paid retirement contributions, better health coverage, and tuition assistance for their children. USC agreed to in-source Sodexo workers at Norris last year, but had refused to do so at Keck until our members made clear that they wouldn’t settle a contract that let their co-workers be treated like second-class citizens. 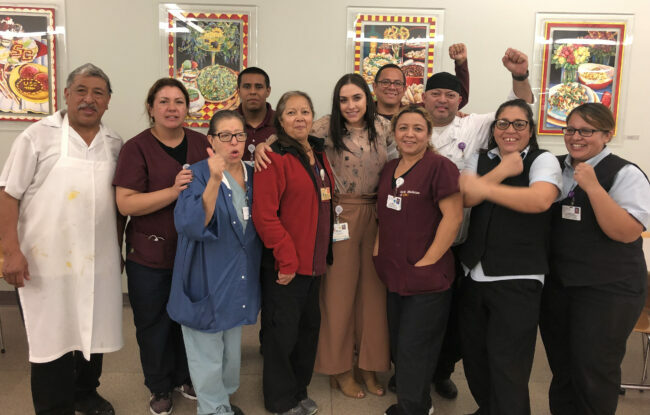 The contract will increase wage scales at the hospitals and boost wages on average 14.9 percent with several workers receiving raises topping 50 percent over the three-year contract. The contract also includes ratification bonuses ranging from $750 to $1,850 for full-time and part-time workers and $500 for per diems. It took hard work and relentlessness to win the contract. Members picketed, petitioned and marched on the administration. A final agreement was reached after workers had authorized a three-day strike.